Our fantastic new community warden Ioan has organised a 5-aside football tournament for the Children. 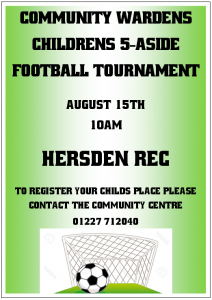 This is a Free of charge event and will be held at Hersden Rec on Wednesday 15th August at 10am! To register your childs place please contact us at the centre on 01227 712040!